Anyone whose career or hobby rotates around podcasting, audio recording or music production requires a condenser mic. Luckily, the market spans a whole lot of these sound gears. So, finding the right for your needs shouldn’t be a fight. However, just like any other sound equipment, the ideal microphone for you boils down to what you need it for. For instance, a mic for your online video games is quite different from what you need for studio recording or for twitch. Talking of studio recording, any other sound engineer will tell you that condenser mics always stand out from all others when used either in a home-based studio or professional setup studios. Whether you are looking for the best condenser microphone under $100, $200, $500 or more, here are our top picks. AKG mics don’t come cheap. You’ll have to fetch out a little bit more for the high SPL handling capability, high sensitivity, and its 3 switchable bass-cut filters in this workhorse. AKG is an Austrian audio company synonymous with excellent sounds. Founded in 1947, this company made an acoustic history with its AKG C12 and D36 which were the world’s first remote-controlled condenser microphones. The CV414 XLII is a 4.5 lbs beast in a compact size. It features a classic and modern design though a closer look reveals that it has borrowed much from the legendary C 414 B-ULS. This multi-pattern condenser microphone sports a large gold-sputtered diaphragm. Both on its front and rear parts, AKG pro CV414 XLII boasts soft-touch locker switches all which help you navigate through its 9 selectable directionality patterns. Right below the switches is a status LED that illuminates your choices. Its digital switching circuitry boasts AKG’s leading-edge technology coupled with modern components that’ll bring out the best in all your projects. Anyone who knows a good mic will with no doubts point at the CV414 XLII without a second thought. Its 5 pickup patterns and 4 other settings to help you find your sweet spot are way hard to let go. Besides recording legendary hits, you’ll also find it useful for a 2-people interview and round table conversations. You also get 3 different bass cut filters and 3 pre-attenuation pads (-6dB, -12dB, and -18dB) to help you achieve your most desired sounds. The C414 XLIII comes loaded with almost everything that you need to create your hits in your home studio or on the go. You get a stylish carrying case, a spider-type shock mount, a pop filter, and a windscreen. If you could spend just a little more bucks than what Rode NT1A costs and opt for the Audio-Technica AT2050, you’re assured of something more solid and more versatile. Audio-Technica is a Japan-based audio products group of companies that has been around for the last almost 6 decades now. A-T is widely known not only for their microphones but their state-of-the-art studio headphones and monitors too. Worth noting, Audio Technica is remembered for its AT4033 cardioid condenser microphone of 1991 which broke the $1000 mark in its class. Besides the Audio Technica AT2050, A-T also has other affordable condenser microphones including the AT2035 if you’re on a tight budget. SPL handling capability: 149 dB. Audio-Technica’s AT2050 is an evolution of its previous model, the AT2020. It’s also more similar to the AT2035 structurally and cosmetic-wise. It has a rugged body construction with an extension over its metallic grill. Its metallic body again boasts a stylish black powder coating that won’t peel or scratch off easily. The AT2035 also has an easily accessible switch that lets you choose between its 3 switchable polar directionalities: cardioids, omni, and figure-of-eight. Its electric circuitry makes all the difference. It has 2 capsule diaphragms with gold-sputtering and which have also been aged for long stability and performance. Like the Rode NT1A above, mic requires an external source for its +48v phantom power. As such, you may have to use a mixer or an interface. Notably, an interface will offer greater sound customization including stereo gain and volume. The freedom to switch between 3 polar patterns is a superb addition since it provides richer sounds with minimal environmental noise. While most people heavily use the cardioid pattern, you’ll also rely on the figure-8 directionality when you want to avoid spills. The omnidirectional pattern, on the other hand, is excellent for recording large bands with a natural sense of space. Its switchable directionalities render the AT2050 useful for several studio recording applications including vocals and acoustic and electric instruments. The original version of this condenser microphone- the Rode NT1- was released into the market in 1995. Almost instantly, it became of the most used condenser mic for home recording artists and professional engineers. 15 years later, Rode decided to offer its huge fans a revised and improved version of the same in the new Rode NT1A. Rode invested mainly in revising the capsule and the electronic design of the newer model thereby resulting to the world’s quietest condenser microphone and an all-time best-seller. This is an Australian manufacturer established in 1967 as Freedman Electronics. Today, Rode is a globally renowned brand and a big hitter in the loudspeaker and microphone markets. This manufacturer has scooped multiple awards in Australia including Red Dot and Australian International Design Awards. Worth noting, Rode was recognized as the best Australian Manufacturing Exporter for 2013. The new NT1A is mainly praised because of its extended dynamic range, high SPL-handling capabilities, clarity, and warmth. Maximum SPL handling: 137 dB. Rode NT1A boasts an excellent build quality consisting of a full metal body with nickel plating and a metallic grill. It also features a gold-plated 3-pin XLR output contact at the base. It will cost you around $250 at the time of this review. As hinted out earlier on, Rode truly put a lot of precision in this condenser microphone’s electric circuitry. The large gold-plated diaphragm is suspended in an exclusive internal capsule shock mounting that significantly reduces it self-noise to the industry leading 5 dBA. Its circuitry is transformer-less. As such, you may not be able to use directly with a studio recording computer or any other recording device. You’ll need to use an interface or standalone phantom power supply to power it. There’s every reason to believe that just like its predecessor, Rode NT1A was precisely made for studio recording. Its flat 20Hz- 20 kHz frequency response offers a unique flat top up. Couple this with its high sensitivity and the 137 dB maximum SPL handling capacity and you’ll be able to use this mic with almost any instrument requiring high frequencies including guitars and violins. With an electric guitar, for instance, Rode NT1A sounds full and crisp. It has a punchy low end and never sounds muddy. On the other side, the highs are a bit sharp but not overwhelming at all. Notably, it’s its crisp vocals recording capabilities that make this the best affordable condenser microphone for voice recording. Amazingly, this mic comes in a ‘Complete vocal recording solution,’ that is, you get everything you need to get going right away. The package includes a professional-grade pop shield, shock mount, dust cover, a 20-ft XLR cable, and a free DVD with recording tips. Again, you get 10 years worth of warranty upon registering your mic on Rode’s website! It is a bit delicate. Shure is a Chicago, USA Company with a reputable history running back to 1925. This company started as a radio parts company before diversifying to carbon microphones. A year after their first carbon microphone, the Shure 55S, Shure brought the Model 40D. This was Shure’s grand entry into condenser microphone world. The Shure KSM27, an all-American made capacitor microphone, is currently the studio standard tool. KSM27 is way smaller in size compared to its elder brothers the KSM32 and 44. Amazingly, despite its small size, you still get more than you would expect from a good home studio condenser microphone. KSM27 is a side-address microphone with a sharp looking and first class build quality. It boasts a reassuring zinc die-cast housing with gold-plated connectors. At a little over 6’’ tall, this diminutive size allows you to place the mic around your snare drums or tom-tom easily while mounted on a swiveling mount. Like most mics before KSM27, it also uses a transformerless preamplifier and will, therefore, require an external phantom power boost. Its body features a -15dB attenuator pad for close-miking your guitars and drums. There’s also another 3-position switch that acts as a tone shaping equalizer. At this mic’s price, we didn’t expect anything short of versatility and good performance. In a vocal session, this mic delivered a full and transparent (but not boomy or overly bright) sound. With an electric guitar, we had to utilize the -15dB pad and didn’t give it much gain on the preamp. KSM27 went on to produce beautiful near-natural sounds. Though no mic will deliver perfectly in all projects, KSM27 does well in a plethora of applications including voice, low-frequency instruments, ensembles, overhead miking, wind instruments, electric guitars and bass and acoustic instruments. Similar to other mics on this list, you get a rubber isolated shock mount and a protective velveteen pouch. If you’re looking for a versatile condenser microphone to use with your acoustic guitars, for female and male vocals, and rap without spending a fortune, Bluebird is our recommendation. The versatility with this bad boy makes it a go-to for many small home-based studios and a backup for those with professional setups too. We’ve personally used it in our studios before upgrading to the pricier Neumann TLM102 MT and Shure KSM27. You can, therefore, take it from me that this is a killer mic that will stand in place of a broken high-end model or help you graduate to professional quality things in style. Max SPL-handling capability: 138 dB. Despite it being the latest in Blue’s series of condenser microphones, Bluebird doesn’t bring any new addition in its design. Like its predecessor- and still existing- Baby Bottle, Bluebird has a unique and somewhat exaggerated design that offers it its place in this category. Perhaps the only HUGE difference is that unlike most of Blue’s condenser mics, this one has been designed to serve in most applications. Again, contrary to a few years back when it was only available when packaged with various Focusrite and Digidesign products, Blue now offers it as a single product. It’s quite hard for anyone to confuse it with any other model other than the Baby Bottle. True to its name, this mic has a tasteful pale blue body tube and about an inch long stalk. Bluebird again features a flattened front surface and a wire mesh grille capsule casing. Like most mics from this brand, the bold ‘Blue’ logo still has its place at the front. This isn’t a USB condenser microphone. Needless to say, you’ll find a male XLR at its base ready to fire the output signal out. Again, it also requires an external source for its phantom power. On the other end, the capsule itself is held by a thin, sleek neck and has a 6-micron Mylar diaphragm inside. Notably, there has been a lot of hate towards this slim neck since it easily snaps off after some time. Though sold as a cardioid, Bluebird’s polar response chart shows some hidden hyper-Cardioid characteristics over 1 kHz. Consequently, in my opinion, it’s better treated as hypercardioid condenser than the former if you need to optimize its rejection of surrounding noise. This thing is also super-sensitive at 27 mV/PA. As such, be aware that if your headphones spill any sounds, they’ll be automatically picked. You should also consider turning the preamp gain a bit low. A few specs that make this a keeper mic are its 138 Db SPL-handling capability coupled by its flat 20Hz- 20 kHz frequency range. It’s able to perform admirably on almost all vocals with as near-to-natural outputs as possible. Bluebird has smooth, open, and airy sounds with clear low ends and mids that make it easy to use in most applications. This pressure gradient large diaphragm condenser microphone comes in a unique and smart wooden box. It’s also supplied with a high-definition 6 meters Blueberry cable, shock mount, and a pop filter. However, though a bonus, you’ll have to spend a few extra bucks on a good pop filter if you don’t own one since the one included is a big…nay. We’re now entering the middle-level price-point of condenser microphones. As you’ll find out, the models in this category are quite hard to beat in terms of clarity and vintage quality. Coming in, for instance, is a type that has been tagged the quietest condenser microphone by most professional studio enthusiasts. It has a recorded 5-dB self-noise level, an internal capsule shock mount, and an amazing 10-year warranty. With its exemplary performance and wowing low price, the MXL 990 is an excellent choice if you’re wondering what gear to spend your 100 bucks on. Compared to the Snowball Ice above, the MXL 990 brings out more detail from your vocals and acoustic instruments besides adding a little sizzle. Its design, high SPL, and sensitivity make it a jack of all trades in your studio. We’ll cover these and more in the sections below. MXL is an audio division brand of Marshall Electronics. This company (named after its owner, Leonard Marshall) was established in 1980. However, it did not venture into microphones until 1998. It’s currently headquartered in Torrance, California, USA but has well-established facilities in Russia, Korea, Japan, China, and the USA. Worth mentioning, most MXL Microphones are able to edge out the competition since they are fitted with the most acclaimed high sound quality Mogami Cables. Secondly, it’s MXL’s goals to deliver high-quality mics at an affordable price; no wonder the stupid-low price you’re getting this MXL 990 at. The MXL 990 boasts an excellent build quality and a substantial feel. Precisely, it has a vintage body style and bronze champagne finish. Its classic look is just great, so you won’t have to hide it from your high-profile clients. However, its champagne finish also means that smudges and fingerprints are quite welcome on its body. As such, you may have to ensure your hands are free of dirt before hitting your studio floors. Another trick would be to make sure that the mic is nicely covered when not in use. Unlike the Snowball iCE above, this one isn’t USB-powered. This means that you’ll need either an interface or mixer to offer it the much-needed phantom power boost. While this may be regarded as a downside compared to our first option, do know that you’ll now be able to fine-tune your audios thereby giving them a better feel before being recorded. Secondly, its lack of onboard transformer is an added advantage since the mic has lower self-noise. As I had pointed out before, its inside features Mogami cabling. Add this to its sturdy body, and you have a compact (though heavy) mic to serve you in most of your studio needs for some time. Weighing 1.2 pounds, MXL 990 is quite heavy to carry around while performing. Luckily, it’s packaged with both the standard and shock mounts for use with either boom or vertical microphone stands. However, we noted that the shock mount helps in eliminating vibrations coming from the floor and the stand than the standard mount. This MXL 990 features fixed cardioids directionality. It’s, therefore, able to pick up clean signals coming from the front with minimal noises from the sides. It also has high sensitivity levels- 15mv/Pa- that makes it capture quiet sounds that may not be audible to the user. As such, it’s paramount that you invest in good pop filters to eliminate these possibilities. MXL 990 has a ¾-inch gold-sputtered diaphragm with a high SPL-handling capability. Its 30Hz – 20 kHz frequency response is also worth noting. It makes this mic perfect for lead and background vocals from any singer. It also gives you quality results when used with several instruments. Despite its low price, MXL 990 still ships with a mic stand clip, a shock mount, and a carrying case for easy and safe ferrying. The Snowball iCE is a perfect illustration of the bridge between professional quality and affordability. Being fair enough, this is the only condenser mic at this price with not-so-bad sound quality. It’ s ideal for entry-level recording enthusiasts, YouTubers, podcasters and home studio artists who are just starting out or learning the ropes before graduating to other pricier models. Snowball iCe is a product of Blue Microphones, a USA-based manufacturer in California. Blue stands for Baltic Latvian Universal Electronics. This company was established in 1995 and is better known for its microphones- condenser, ribbon, and dynamic- and headphones. Snowball iCE’s main unit is in the form of a ball and automatically necessitates the use of tripod stand included in the package. The ‘ball’ measures around 4’’ in diameter and weighs around 1.5 pounds. Its front side scores highly in terms of aesthetics and will definitely look cool on your desktops. It flaunts a bold retro-looking ‘Blue’ logo scripted on a wire mesh grille. Beneath this grille, you’ll find a foam windscreen that protects the ½’’ diaphragm from dust and other foreign materials. At the top, there is an LED that shines brightly once the microphone is connected to the recording computer or laptop via USB. Talking of connectivity and powering, Snow iCE features a metal-reinforced USB port at the back. Unfortunately, this is the only ‘audio connection’ on this model. This means that you can’t connect it to your headphones or line level outs which is quite understandable given the low price. What amazed us with this model is its great emphasis on simplicity, ease of usage, and compatibility. Snowball iCE offers plug-and-play operations and requires no driver installation or fancy recording software. As I mentioned before, Snowball iCE is USB-powered. Amazingly, it has its phantom power. This means that you don’t need to buy an interface (this is a great feature if you don’t have enough for an interface). It also makes it easy for you to record anywhere you have your laptop. Without forgetting, this microphone is compatible with both PC and Mac computers. Again, it’s USB 1.0-compatible which means that you can still use it with your old computer. Another nice thing with the Snowball iCE is that you can use it with your iPhone or iPad. To do this, you’ll require the USB to 30-pin adapter or the Lightning to USB adapter by Apple (not in the package, though). And how’s the sound quality? Snowball iCE has cardioids polar directionality. This means that it receives sounds from the front and rejects most noise from the rear. It uses a single-diaphragm and has amazingly clear audios for its price. However, do know that due to this mic’s design and sensitivity, it tends to pick up some noises and vibration from the computer. As such, it may require some isolation for clearer sounds. It ships with a 6-inch USB cable and a tripod desktop stand. The Avantone Pro CV-12 is another sweet spot if you want something beautiful, super warm on vocals, and even richer on your acoustics. But first, a 20-second course on its maker. Avantone is a USA company based in New York. It aims at offering products with greater functionality for the budget-operating home-based studios. This company also puts greater emphasis in its mics not only in the electric circuitry but on appearance too. The Avantone Pro CV-12 doesn’t shy away from this. CV-12 is quite irresistible aesthetically-speaking. It has a rugged metallic body tube with an attractive Cabernet wine-red finish. Its shiny and well-polished nickel trim and head-grille also complement its overall design. However, do know that its red finish isn’t scratch-proof. Secondly, its grill is quite thin and may get dented easily. You, therefore, need to be extra-cautious on this baby. The Avantone Pro CV-12 also features dual gold-sputtered Mylar capsules and a PS-12 power supply. What this means is that you need not connect it to an interface or mixer to get it working. However, you can still go with that option for versatility and customization purposes. Setting up is quite easy and straightforward. You just need to lodge the shock-mount on a mic stand and then slip your wired condenser microphone through the shock-mount. Later, connect the XLR cable to your mixer or interface, and warm it for about 15 minutes before doing your thing. Avantone CV-12 is built to offer extreme versatility in terms of sound quality. Unlike all the other units that we’ve seen thus far, this one offers the 3 major polar patterns: cardioid, omnidirectional, and figure-8, and 6 other ‘’in-between’’ settings. Though you’ll probably use the 3 major directionalities, the other 6 settings are good to play and experiment with. They’ll help in sweetening up almost anything that goes in front of it including female and male vocals, cello, trumpet, violin, solo flute, and drum kits. You get a retro-style shock mount, an aluminum storage case, a 3-pin audio cable, and a PS-12 power supply. Coming at around 700 bucks , Neumann TLM102 MT is the most affordable condenser microphone condenser from Neumann. Its elder brothers - the U47 and Neumann U87- would rudely ask for a few thousand dollars if they were brought back. Neumann is renowned for their high-end but best-in-class mics with almost everything that a pro or newbie studio artist would look for…except the price. This company claims to be the origin of the condenser microphones. Though this is arguably a mere marketing hype, its long history dating back to 1928 followed by decades of success makes it quite believable. TLM102 is an affordable option for broadcasters and studio artists to enter into Neumann’s world. At 1.1lbs, Neumann TLM102 is amongst the most compact and lightest microphones in this list. This is, however, reflected by its small size which is slightly smaller than its brother the TLM103. It’s available in 2 finish options: nickel and matte. This is a large-diaphragm microphone. It features a pressure gradient transducer and a Transformer-less circuitry which calls for a separate source of phantom power. With a stated 12 dB-SPL, A-weighted, self-noise the TLM102 is a good mic to work with most of your projects. Though it’s not as quiet as the Rode NT1A, the shock mount (included in the package) will help in isolating the mic from vibrations. One thing that caught our attention when trying out this mic is that there wasn’t any noticeable rises or sparks at its high end. It gave a full natural sound with my acoustic guitar and a healthy knock when used in front of the drum kits. It also offers excellent sounds on both male and female vocals that easily stand out in the mix. Sony requires no detailed introduction. it is a brand that we have come to love for its quality products. At over 11 grand elsewhere and just a little tad less than that on Amazon, the Sony C800GPAC could the world’s most expensive condenser microphone ever built. However, in my opinion, you could get between 8-10 other best-in-class mics for that amount. Well, I’m not discouraging you from getting it. Furthermore, it’s probably the highest peak you can go in this realm. And, it also boasts certain great features that will give you quality value for your money. Sony C800GPAC has a similar body structure to the Audio-Technica AT2050 only that it’s slightly smaller. Its stylish black powder coating doesn’t peel off and will offer the same appealing look for some years- of course, with much care. At the front, there’s a switch to customize between cardioid and omnidirectional polar patterns. This is a great option that enables pickup control for superior instrument and vocals capturing. What looks like a handle extension is, in fact, a Peltier- based cooling system. This is a feature that you won’t find in any other condenser microphone. It keeps the tube at an optimum operating temperature and also boosts its aesthetic department. Sony C800GPAC is highly rated for vocal recording. For the highest possible sound quality, Sony recommends that you give the components about an hour to warm up. The mic boasts high-end dual large diaphragm with true and warm vocal qualities. It also features electronically switchable pick-up directionality so you can choose what does well with your recording projects. It’s supplied with a 26ft power cable, a multi-pin cable, a cradle suspension, and a windscreen. For clarity and greater understanding, we’ll define condenser mic is and the different types and applications. We’ll also identify the difference between a condenser microphone and a dynamic mic (a commonly asked question) and learn a few key specs worth knowing in this department. A condenser mic derives its name from its use of a capacitor to create sounds. All mics feature a diaphragm which is a metallic plate placed closely to another extremely thin foil or skin. The 2 plates are placed so close to each other so that they maintain an electrostatic field once they are charged from a capacitor. When sound vibrations hit the front plate (diaphragm), it vibrates back and forth moving closer to the back plate. These vibrations cause a capacitance change where some of the charge is changed into an electric signal that will later come out of your monitors or speakers as the mic’s output. Before this, though, the electric signal will require a 48-volt power boost to create a strong signal that can be heard. When condenser microphones were first introduced each unit had to have its phantom power box. This was quite hectic especially for a studio that recorded a full band with a mic for each singer. Across the years, engineers have come up with various ways to eliminate the need for these boxes. Today, an audio interface has become the industry standard. Simply put, an audio interface is a small box that connects your mics, guitars, keyboards, and other studio gear to your recording computer or mixer. The juicy part about interfaces is that besides providing your condenser mic with phantom power, they also have Analog-to-Digital converters. These converters change the mic’s analog signals into digital formats that can be comprehended by your recording laptop for editing and mixing. An interface also has several preamps that boost the mic signals into usable line-level signals. Even better, these sound boxes also offer you control over you mic’s gain and FX amongst other options. However, not all audio interfaces offer phantom power for your condenser mic. So, be sure to go through our collection of the best interfaces 2017 to understand the different varieties there’re. 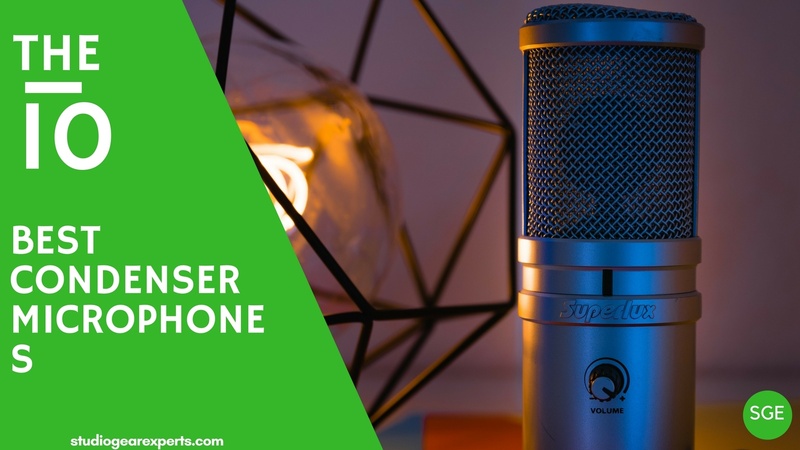 You can also opt for a USB-powered condenser microphone that connects directly to your laptop. These mics come with an onboard power supply –from a battery- and only require being plugged into your recording computer via a USB. What’s the difference between a dynamic mic and a condenser mic? All mics are fitted with a diaphragm that converts sound waves into an electric signal. The difference between these 2 models arises from how their diaphragms convert vibrations into electric signals. As we saw earlier on, a condenser mic engages a capacitor in its translation mechanism. On the other hand, a dynamic microphone uses an inductive coil attached to its diaphragm and placed in a permanent magnetic field. As sound waves hit the diaphragm, the coil vibrates and causes subtle shifts in its voltage output which causes a change in the electric signals sent to the computer. This difference in mechanism makes the 2 models excellent players in their different fields of applicability. Dynamic microphone﻿﻿s have excellent high SPL-handling (Sound Pressure Level) capability and, therefore, ideal for live performance. On the other hand, high SPL causes distortion in condenser mics due to their high sensitivity. However, their high sensitivity is their strength in studio recording. Remember that honesty to the original sound is vital in a recording scenario. You want a mic that can pick up the best and give supreme quality sounds from your vocals, upright pianos, snare drums, and electric guitars. No other microphone does that well than a condenser microphone. However, do know that the condenser microphones are capable of picking up unnecessary noises coming from either within the studio or outside. Sounds coming from the fans, chirping birds or car engines can easily find a way to the ultra-sensitive recording condenser microphone. These mics have greater sensitivity to the singer’s voice when at the front and a little from the sides. They don’t receive sounds coming from 1800 opposite of the direction they are aimed. They are ideal for loud stages. These mics have greater isolation of ambient sound and more resistant to feedback than cardioid microphones. However, they have a little bit high sensitivity to sounds coming directly from their rear side. As such, you may want to consider where your studio monitors are positioned. You can’t go wrong with these if you want to pick up specific sounds from a loud environment though. Hypercardioid mics- they receive sounds from the front and those from 1800 opposite the direction their diaphragm is aimed. Also referred to as ‘figure of eight,' these models receive sounds from the front and the rear but not from the sides (900). These mics receive sounds from all angles irrespective of where they are aimed at. The major setback with these is that you can’t avoid sounds from undesired sources. These are versatile models whose polar patterns can be changed, for instance, from bidirectional to unidirectional. This is another important aspect that you need to understand. Frequency response (measured in hertz) refers to the range at which the mic will be able to pick up sounds supremely. People hear things between 20 Hz and 20 kHz. A good condenser microphones can capture these top-end frequencies without getting muddier while dynamic microphones lose it at around 16 kHz. As such, if you’re looking for a mic to record high-end details from sources such as singer’s voice, acoustic guitars, keyboards, drum overheads, and electric guitars, a condenser mic should be the first on your list. A condenser with lower numbers on the lower frequency side is also more ideal. In fact, those with the ‘’extended low-frequency response’’ tag are more suitable. Proximity effect refers to the range of which the bass frequencies are louder as the sound source near the mic. While this is not regularly regarded as a spec, it’s worth putting in mind especially if you need to unleash the best bass tones from an instrument through miking. This talks about the maximum volume of sound in decibels that a mic can handle without damaging the diaphragm. This is a vital aspect to consider if you plan to use your mic with loud instruments. A good condenser mic should deliver quality sounds at between 100dB-130dB. If you want to play your amplified instruments at a higher dB than the recommended, then you should opt for a dynamic microphone. This is the direct opposite of SPL. It refers to the lowest sounds in decibels that the mic can detect. Condenser microphones are known as the best-in-class in this characteristic. No wonder they are so much respected in both home and professional recording studios. Besides the specs, it’s also imperative that we look at the different types of condenser microphones on the market. This will not only narrow down your choice but also slash your searching time quite significantly. A common question that we’ve encountered is, ‘’Does the size of a microphone’s diaphragm matter?’’ Our answer has always been a big YES when referring to condenser mics and ‘’Not really’’ for dynamic microphones. In case you’re not new to mics, you might have noticed that the explanation as either large or small is commonly found in condenser microphones books and rarely in dynamic mics descriptions. So, what is the difference between a large and a small diaphragm microphone? You must be wondering. Normally, a condenser microphone is said to be large if its capsule is fitted with a diaphragm measuring between ¾’’and 1’’ (22mm – 25.4mm). For the small models, the size of the diaphragm is usually a ½’’ or less. Quite interestingly, large diaphragm condenser microphones have a large body construction while small diaphragm mics are slim and smaller in body size. The most obvious advantage that a large diaphragm microphone has over its smaller counterpart is in its excellent self-noise reduction. This, therefore, makes it a killer choice for excellent recording of voices and an array of sound equipment. Secondly, large diaphragm condenser mics are able to receive more acoustic energy which translates to higher signal voltage generation. However, these models don’t win in all battles. Their need for suspension and big size make it hard to use in tight space areas. On the other hand, small diaphragm condenser microphones have a superb transient response, consistent pickup patterns, and also work well in high frequencies. Unlike their immediate rivalries, small diaphragm condenser mics capture sounds and voices in their most natural form without making them sound artificially pleasing. As the name suggests, these microphones have 2 diaphragms facing opposite directions. These models are a perfect choice for recording duets or a band with multiple members. Professionally speaking, dual-diaphragm microphones are more effective in balancing sounds coming from 2 different sources than when using 2 single-diaphragm mics. Commonly referred to as old-school, tube condenser microphones are usually associated with radio studio broadcasters. The ability to give any recorded sound a warmly touch still secures this model a slot in modern day’s professional recording studio. Another factor to consider when shopping for a professional quality condenser microphone is what accessories are included in the package. This also helps in avoiding last minute frustrations. No other thing irritates than not being able to use your new mic immediately after delivery because, apparently, it does not ship with this or that. We’ve already touched on this. Here, we did mention that some condenser microphones may require simple USB-powering to function. On the other hand, other types need 48v of power boost. This can either be from a standalone powerbox or an audio interface. A﻿﻿nd how much do condenser microphones cost? As a rule of thumb, always steer away from the very lowly-priced condenser microphones. Maximizing your studio’s sound quality is a proposition that’ll drain you a considerable amount of bucks. Well, this doesn’t nullify all possibilities of falling for good quality yet cheap condenser microphones that won’t break the $100 barrier. The MXL 990 and the Blue Snowball iCE Condenser mics, for instance, are quite commendable entry-level models that won’t cost you more than a hundred bucks and still do an amazing job. However, as you just found out in the product reviews, the more you spend, the higher your chances of achieving supreme quality sounds. True: Good things don’t come cheap. Purchasing a condenser mic (in your budget) is a must if you’re not ready to gamble with the sound quality of your projects. Luckily, the market boasts a few selectable options. Here, we’ve just revealed 10 options that we believe could the best for vocals and instruments today. Whether you need one under 100 or you feel that you’re ready to play in the big league with a 10-grand one, the list has all in details. What next? The ball is in your court. Choose what goes well for you and ROCK. Lastly, don’t forget to share this with friends who need to up their game too.